Prepare the pork: Combine the garlic powder, sugars, thyme and salt in a small bowl, and set aside. Rub each pork chop with mustard (about 1 tablespoon per chop), and coat both sides with the spice mixture. Refrigerate for at least two hours, or up to overnight. Make the compote: heat oil in a large heavy skillet. Once shimmering, add the onions and lower the heat; cook until browned and nearly translucent, about 30 minutes (monitoring the heat so as not to burn them). 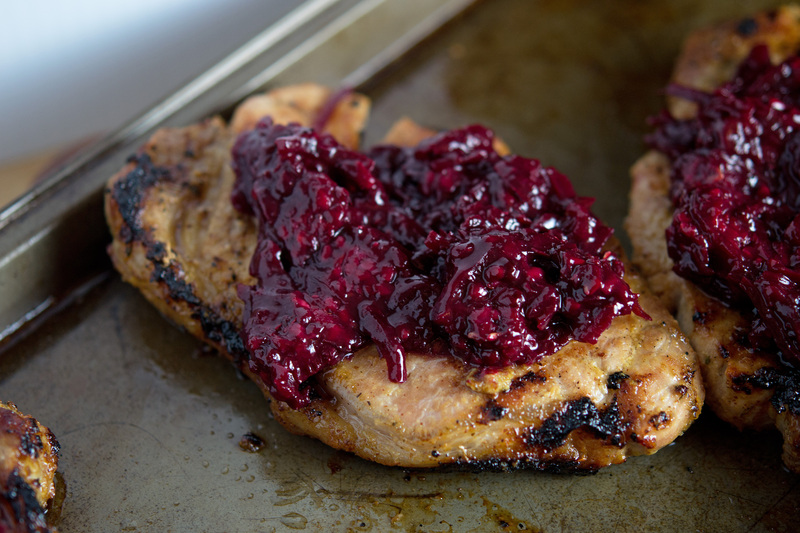 Once browned, add the blackberries and increase the heat to medium, cooking for an additional two minutes. Add a large splash of white wine, and cook until nearly evaporated. Add the vinegar and thyme. Reduce the mixture to a simmer, cooking until the berries are broken down and the sauce is thickened; add water as needed, by tablespoons (Note: compote can be made a day ahead – refrigerate, and bring to room temperature before serving). Grill the pork: Heat grill to medium-high heat, and add the chops – grill about 5 minutes per side, or until their internal temperature reaches 145° F. Once done, place chops on a platter and cover with foil – allow to sit for 10 minutes. Top each with compote, and enjoy!